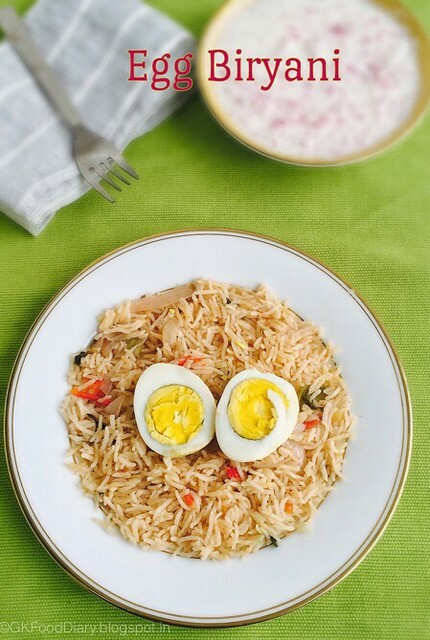 I wanted to post this simple egg biryani from long time. I like Hyderabadi egg dum biryani very much and I used to order often when we visit restaurants for lunch. 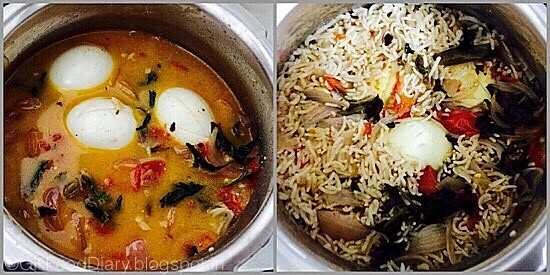 I wanted to try egg dum biryani at home but couldn’t get time as it involves long process for making. I will sure post the authentic egg biryani recipe sometime soon. Hence tried this quick version of egg biryani in pressure cooker with simple ingredients and to my surprise it turned out super tasty but yet the taste is slightly different from the authentic egg dum biryani. 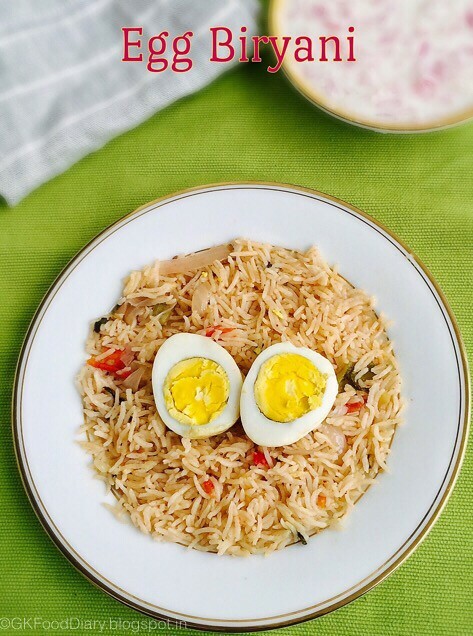 I loved this simple and quick version of egg biryani too. The delicious, filling and nutritional biryani will be ready with in half an hour. Isn’t that cool? Let’s check the recipe. Put the eggs in a vessel with water. Boil eggs for 10 minutes in water. Remove the shells once it cool down and slit them vertically using a fork or knife. Keep this aside. No need to hard boil the eggs as we are going to cook the eggs again along with rice. Slice onions lengthwise and chop tomatoes finely. Roughly chop corainder and mint leaves. Slit the green chillies into two. Set aside. Measure 1 cup of rice and wash it well in running water. Soak the rice in water for at least half an hour. 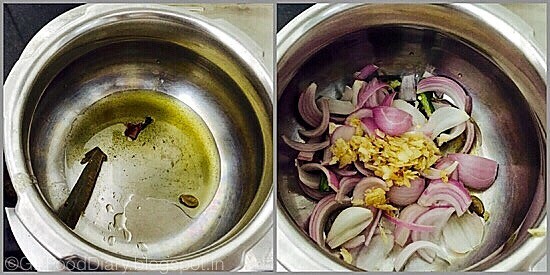 Take all the ingredients needed to make a Biryani masala and make a coarse powder using mortar and pestle. Keep it ready. Heat a pressure cooker with ghee & oil. Add bay leaves, cinnamon, cloves, & cardamom. Fry for a minute and then add onions along with ginger garlic paste. Saute them nicely until golden brown. Once onions becomes transparent and the raw smell of ginger garlic paste leaves, add tomatoes. Fry the tomatoes until the raw smell leaves and become mushy. Then add corainder leaves, mint leaves. Mix it well and stir it for three minutes. Now add red chilli powder,coriander powder and biryani masala powder. Mix them together and fry them for five minutes. Now add thick curd and mix well with the gravy. 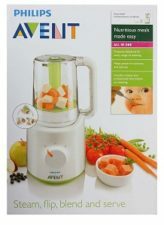 Saute them for 3 minutes. Then add boiled eggs and mix carefully with the gravy. Fry the eggs well for three minutes so that the eggs are coated well with the masala. Now add soaked basmati rice and mix well. Add 1.25 cups of water and bring it to a boil. Then close the lid of pressure cooker and cook everything in low medium flame for three whistles. Once the pressure releases, open the cooker and fluff the rice with a spoon slowly and add lemon juice and top with ghee if required. 1. Put the eggs in a vessel with water. 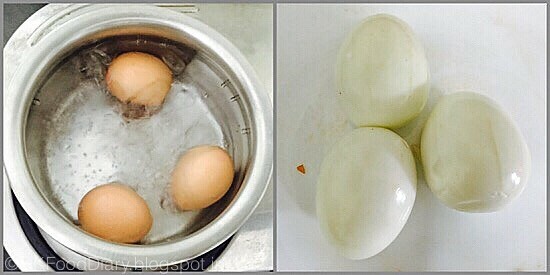 Boil eggs for 10 minutes in water. Remove the shells once it cool down and slit them vertically using a fork or knife. Keep this aside. 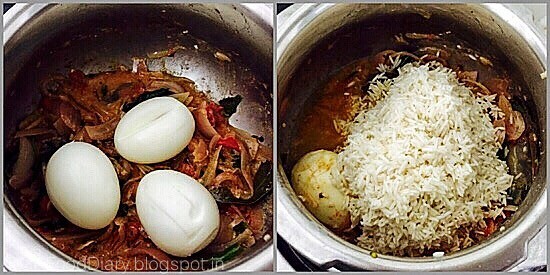 No need to hard boil the eggs as we are going to cook the eggs again along with rice. 2. Slice onions lengthwise and chop tomatoes finely. Roughly chop coriander and mint leaves. Slit the green chillies into two. Set aside. Measure 1 cup of rice and wash it well in running water. Soak the rice in water for at least half an hour. 3. 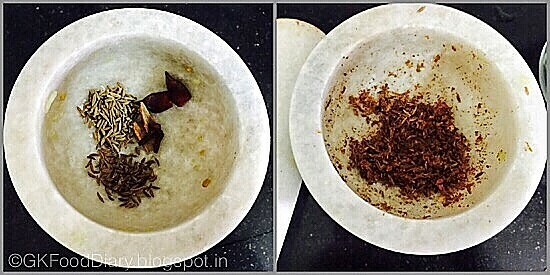 Take all the ingredients needed to make a Biryani masala and make a coarse powder using mortar and pestle. Keep it ready. 1. Heat a pressure cooker with ghee & oil. Add bay leaves, cinnamon, cloves, & cardamom. Fry for a minute and then add onions along with ginger garlic paste. Saute them nicely until golden brown. 2. 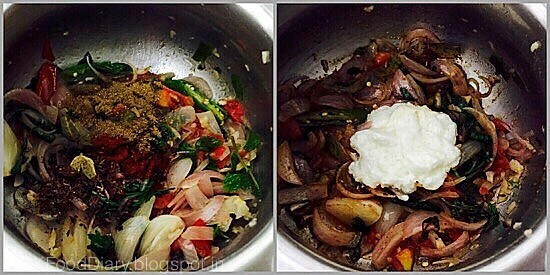 Once onions becomes transparent and the raw smell of ginger garlic paste leaves, add tomatoes. Fry the tomatoes until the raw smell leaves and become mushy. 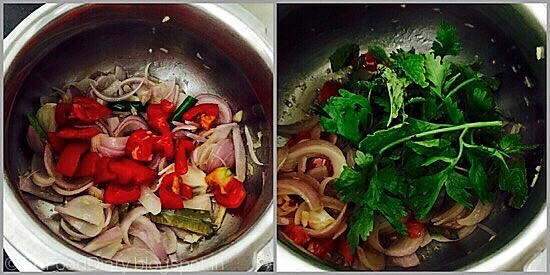 Then add coriander leaves, mint leaves. Mix it well and stir it for three minutes. 3. Now add red chilli powder,coriander powder and biryani masala powder. Mix them together and fry them for five minutes. Now add thick curd and mix well with the gravy. Saute them for 3 minutes. 4. Then add boiled eggs and mix carefully with the gravy. Fry the eggs well for three minutes so that the eggs are coated well with the masala. Now add soaked basmati rice and mix well. 5. Add 1.25 cups of water and bring it to a boil. Then close the lid of pressure cooker and cook everything in low medium flame for three whistles. Once the pressure releases, open the cooker and fluff the rice with a spoon slowly and add lemon juice and top with ghee if required. 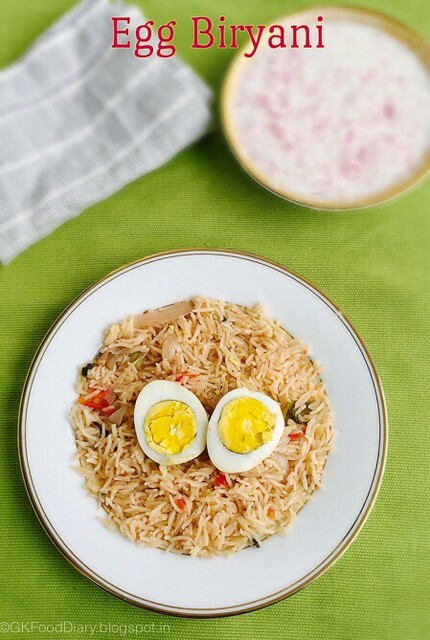 Serve the egg biryani with onion raita. Tastes yum. I usually hard boil the eggs for 15 minutes. For this biryani I boiled the eggs for 10 minutes until soft but not hard. Alternatively you can add fry the boiled eggs in a pan for 3 minutes with little red chilli powder, coriander powder and garam masala powder and add it after opening the pressure cooker. There will not be much difference in taste. Soak the rice at least for 30 minutes or even 1 hour. 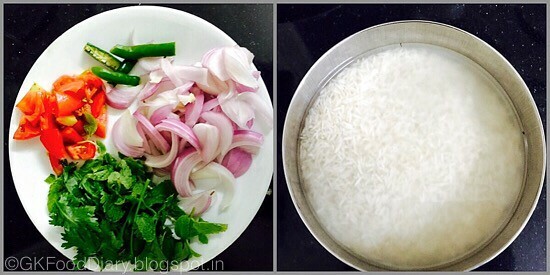 Soaking the rice as much as possible gives soft and fluffy biryani. Biryani masala powder adds a nice flavor to the biryani. So don’t skip it. I like egg biriyani. I am happy to visit your blog. Thanks for sharing. I love eggs that to with briyani ha yummy!nebosh training institute in India|nebosh igc training in Tamil nadu| safety officer courses in tamilnadu|Industrial safety engineering course in india| fire and safety management course training india|iosh ms course syllabus.